Pizza Hut - Chartwell Group David Snell of the Chartwell Group provides high technology consulting in the areas of operations management, sales and marketing strategic and tactical planning, business development management and investments. Abigail A. Lorden, Editor-in-Chief The apple may have been a forbidden fruit in the Garden of Eden, but for the Hut of Pizza, Apple has become a proverbial money tree. 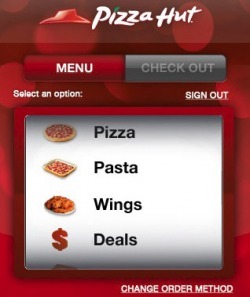 Pizza Hut (www.pizzahut.com) has already driven well over one million dollars in sales through a food ordering application it developed for Apple's iPhone and iPod Touch devices. Released via the iTunes store in July 2009, the app has more than 1.2 million downloads and shows no signs of slowing down. By all accounts, pizza-cravers love the app's interactivity and ingenuity: it leverages some of the unique, multi-touch characteristics of iPhone technology to create, literally, an explosive experience. When ordering a pizza, for example, users virtually choose a type of crust; then they "pinch" it to select a size, and drag-and-drop toppings. If too many toppings are added, the pizza explodes, with pepperoni and mushrooms ricocheting across the screen. Despite the whimsy, however, the iPhone application is anything but a toy. It's the result of an aggressive first-to-market strategy that has garnered Pizza Hut, a subsidiary of Yum! Brands, two top awards from the Mobile Marketing Association: Mobile Display Campaign in North America, and Emerging Technology Campaign in North America. "It was very important to us to be the first to market," recalls Baron Concors, CIO of Pizza Hut, who came to the company in December 2008 after nearly ten years in retail technology, most recently as the vice president of global retail technology with FedEx. Since joining the hospitality industry, Concors is energized by Pizza Hut's willingness to embrace social networking and mobile connectivity. On the retail side, "there are a lot of people who still think social media is a fad and they shouldn't be playing in the mobile space. I really worry for those companies. The secret sauce for Pizza Hut, says Concors, "is that we're willing to take those calculated risks and a lot of organizations choose not to take any risks for fear of failure. If you don't take great risk, you're never going to be truly innovative in your space." To be truly innovative, Concors and the other Pizza Hut teams decided they "didn't want to build an ordinary app; we wanted it to be extraordinary." In less than five months, and with the assistance of two critical partners, Pizza Hut's digital marketing and technology teams did just that, from first concept to full roll-out. The roadmap for Pizza Hut relied on limiting the scope of the project, at least initially, for a fast product launch. "Our roadmap allowed us to focus on building critical functionality for launch, while leveraging as many existing assets as possible to solve customer needs," explains Carlos Chavez, director of eCommerce technology for Pizza Hut. For example, advanced account management functions are only available through the website. While the ideal customer experience would be to offer these functions in the iPhone client, Chavez notes that this would have delayed the launch for rarely used, although important, functionality. "Instead we focused our efforts on the usability factor that has resulted in my six-year-old son using my iPhone to order from Pizza Hut weekly," explains Chavez. "We followed up with a version update soon after launch to address some of the scope we deferred during the initial release." Prior to deployment, Pizza Hut also employed focus groups to solicit feedback on the application's usability, creativity and general appeal. Concors credits much of the application's "fun factor" to lessons learned from the focus groups. "We tried to get a sampling of not only Pizza Hut customers, but also people who do and don't use iPhones. There are several great ideas from the focus group that resulted in a better application," recalls Concors. "They said, 'have some fun with this!'" For example, users can shake the phone to coat their chicken wings with their chosen sauce, thanks to direct input from the focus-group; as with the over-zealous topping chooser, if the user shakes too long the sauce splatters across the screen. Two technology partners were instrumental in Pizza Hut's agile software development approach. Pizza Hut's digital marketing team worked with Dallas-based firm IMC2 (www.imc2.com) to lead the design of the application's user interface and to define the customer experience. "The final design boasts a simplistic shopping experience that takes advantage of the slick features within the iPhone such as animations, gestures, and the accelerometer, or motion-based input," explains Kevin Fish, project manager for Pizza Hut. A second technology partner, QuikOrder out of Chicago (www.quikorder.com), powers the underpinnings of the eCommerce platform. "Working with QuikOrder, we developed a service-based API that exposes the main features of our web-based ordering system to the iPhone application," adds Fish. This approach has already worked for Pizza Hut: leveraging its proven online ordering platform allowed the company to quickly deploy other ordering channels, including SMS ordering in January 2008 and Facebook-based ordering later that year, without having to retrain restaurant employees. "The big wild card when you're developing an iPhone app is that Apple has a strict approval process and you never know how long it will take," notes Concors. The vetting process is largely about weeding out malicious code, but it can be time consuming. "For us it was very fast; I guess because Apple really liked what they saw." Eventually the app was featured in Apple commercials, print ads and in-store marketing, which Pizza Hut estimates led to millions of dollars in free publicity. "That's something we never counted on or expected," notes Concors. As to the success of this type of project, Concors stresses the importance of making the app really useful, or else you can end up doing more harm than good. Stay far away from applications that do nothing more than re-route the user to your website, he advises. "At the end of the day, customers can see through that." In addition, give considerable thought to the choice of hardware and platform the app will run on, based on how the unique features and usability of the device match up with the goals and usability of the application. "Some people choose to make an application that will work on any device. If you make that choice, you may give up some of the unique elements of a device itself: GPS, tilting, etc." For Pizza Hut, the unique features of the iPhone were critical in creating branded differentiation. That said, the company does have a go-forward strategy to pursue other platforms. "While time was of the essence, we knew this project would serve as a springboard for future growth of our eCommerce offering," says Fish. The API Pizza Hut developed isn't limited to just the iPhone. It is a flexible service that will be a key enabler for future ordering channels from other platforms. Though at this time there are no strict timelines for that move, Concors explains that, "there are a lot of lessons learned and we can take them and apply them to the next time. We can't fool ourselves to think that the iPhone will be the only player forever. We need to make strategic decisions about where to take it."